When you think about new and engaging marketing strategies to help grow your practice, your first though probably isn’t “a newsletter.” After all, isn’t that a horribly dated, overused idea? It isn’t 1995 anymore! Believe it or not, newsletter marketing done right can be one of the most powerful tools in your marketing arsenal to engage patients and make sure they return to your office. At Top Practices, we remind doctors of this all the time: patients who don’t have a reason to remember you will definitely not remember you. Once you’ve treated their pain or other problems, they don’t have a reason to remember your name, even if they liked you. This means they may not think of you when they need to come back or when they’re recommending help to family and friends. You have to stay in regular communication so they think of not only how helpful you were, but how you could help them again or others they care about in their lives. This is what newsletter marketing does for your practice. It’s a simple, engaging, interesting way to communicate with and educate your patients so they continue to feel like you care and would help them in the future. New patients who give you their information, potential patients who request information from you, and website visitors who sign up for your newsletter online grow the list of people you’re communicating with on a regular basis. This allows you to stay connected to them so they think of you first when they have needs you can meet. A high-quality newsletter is one that incorporates your logo, uses solid design, doesn’t feel too cluttered, and generally looks nice. People don’t keep or read ugly newsletters—they toss them. By making yours visually appealing and interesting to look at, you make it more likely your patients will be intrigued and give it a chance. It can’t be interesting to look at but full of boring information your patients don’t care about, though. They’ll quickly toss and forget about it when it doesn’t catch their attention. You want to fill the whole newsletter with articles in a conversational tone that are directed what intrigues them, not just you. So after you’ve covered one or two short articles about medical conditions or treatments, try including healthy recipes, or local events, or information about happenings with your staff or your office. Just as importantly, you need to use your newsletter marketing often enough that people don’t forget about you between issues. A quarterly issue is not enough. Several months is far too long to go without reconnecting with many patients. Monthly is usually what you need. It’s a lot of work to produce monthly content, but reengaging patients that often is worth it. So newsletter marketing is definitely a valuable tool for a practice of any size. The problem then becomes actually doing it. It’s difficult to create and send out a newsletter every month, much less one that is actually great. That work alone is a reason why this tool is so underused. That’s where Top Practices can help. Our Podiatry Practice Newsletter Program is designed to work with you to create a newsletter for your unique practice. The program also fits nicely with our automated database and e-mail marketing services, allowing us to help you send out electronic copies to your whole list every month. Launching and maintaining newsletter marketing for your practice is not only possible, it’s a valuable tool many doctors are under-using. Don’t let this opportunity to connect with current and potential patients pass you by. 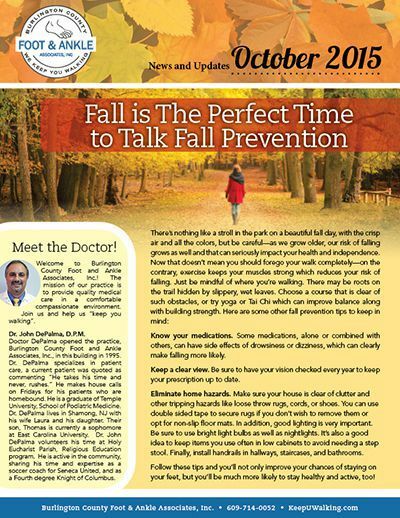 Our team is happy to help you get started in our Podiatry Practice Newsletter Program. If you have questions, just let us know at [email protected]. You can also call (717) 725-2679.